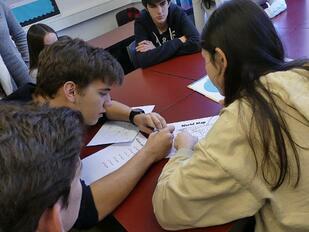 Every year Brillantmont celebrates the written word during Reading Week. Librarian Mrs Robbins and English teacher Mrs Nikyulu , who organised it, are not alone in believing that, even in this digital, fast-paced world, nothing beats turning the printed page. As the softly falling snowflakes herald the arrival of winter, what could be better than snuggling up with a good book and being transported to another world? 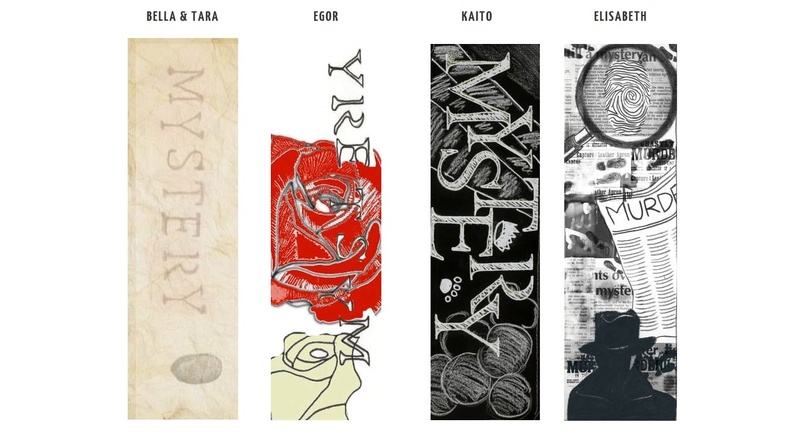 This year, the theme was "Mystery" as revealed by the wonderful bookmarks created by our talented art students. Congratulations to Elisabeth on her winning design. 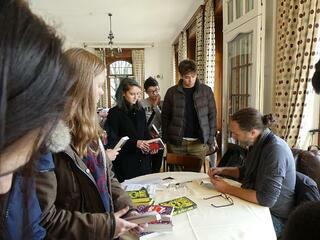 We were delighted to welcome prize-winning author Marcus Sedgwick. He has written numerous novels for young people and uses the genre of mystery to explore some very relevant issues, such as rising sea levels. The winner and nominee of many awards, his insightful work is hugely successful and appealing. Brillantmont students thoroughly enjoyed his presentation on developing character and some classes were able to put his advice to good use in the creative writing workshops he hosted. Later in the week, the Great BM Mystery saw students working collaboratively as sleuths to solve the enigma, whilst Thursday's English bookstore saw record-breaking sales of books, which is hugely encouraging. The Drop Everything and Read Sessions (DEAR) took place every day for 15 minutes and many teachers shared their own reading matter out loud with their students. That is the joy of reading: it can be a solitary pleasure or a collective celebration of the power of language. 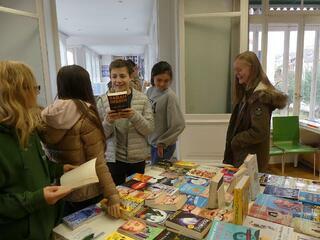 The enthusiastic buzz around school was proof of how much students loved the week, suitably summed up by 9th Grader Kirill, "Reading is good for you. It expands my vocabulary and it's where all my knowledge comes from. " We couldn't agree more!